AMAZING BUILDING This is the exclusive and much sought after residence of “Phoebe on Queen”, a luxurious and noted building in the heart of Queen West. 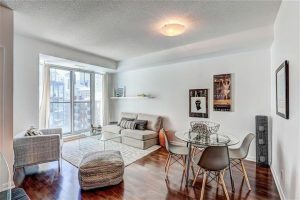 GREAT LAYOUT Stunning 1 bedroom plus den with ensuite laundry, parking and a storage room directly behind the parking space. Bright and sunny east facing suite. The large den could be a second bedroom with sliding glass doors. WONDERFUL LOCATION Steps to shopping, streetcar, Financial district, theatres, OCAD, AGO, hospitals, universities, park.